Dubai, UAE, March 28, 2019: Dubai is home to a rich and diverse natural environment, offering a unique mix of topography for different ecosystems and wildlife. Be it across the mountains, mangroves, desert or coastline, the emirate is a natural habitat to a variety of desert dwellers. Although urban development across the world has led many species to the brink of extinction, Dubai has spearheaded several initiatives that are increasingly committed to preserving its priceless natural heritage. Thanks to responsible tourism practices supported by Dubai Sustainable Tourism (DST), an initiative by Dubai’s Department of Tourism & Commerce Marketing (Dubai Tourism), visitors can explore these natural environments without putting the landscape or its wildlife at risk. Prime examples of ecotourism attractions for nature-lovers in Dubai are the Al Marmoom Desert and the craggy peaks of Hatta, which invite visitors to explore the region’s diverse flora and fauna, stunning landscapes and beautiful natural attractions. The Al Marmoom Desert is the latest edition to Dubai’s collection of nature reserves, occupying almost 10 per cent of the emirate’s total area. It will soon be home to the Al Marmoom Desert Conservation Reserve, the largest tourism project of its kind in the region focusing on the desert environment. It is also the first unfenced desert conservation reserve in the UAE, rich with hundreds of species of wildlife – from the Arabian Oryx, Arabian Gazelles, Sand Gazelles, to foxes and wild cats. The reserve will include ten animal and bird observation platforms, star and sunset observations decks, and even an outdoor theatre. Meanwhile, those looking to travel back in time to discover the historical culture of Dubai while enjoying the cool winter temperatures can head to the mountain town of Hatta. This quiet retreat, nestled in the Hajar Mountains, is known for its ancient Hatta Fort, the bright turquoise water of the Hatta Dam and the remnants of a village from days gone by. 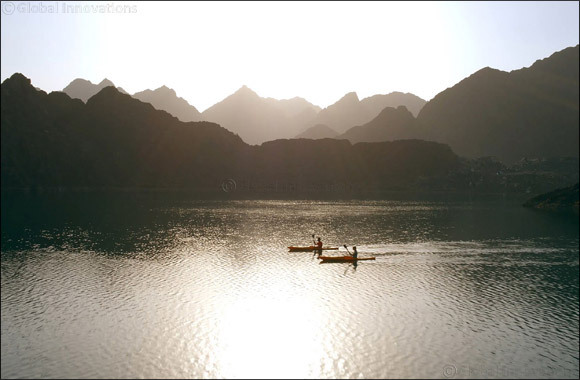 Located nearly 130km south-east of central Dubai, the untamed environment makes the mountain enclave of Hatta the ideal spot for thrill-seekers and nature-lovers; whether you’re looking to take on the rough terrain by mountain bike, tackle the waters by kayak, or simply explore the cultural town by foot, there’s much to do just over an hour away from central Dubai. While it is encouraged to personally explore these natural environments, it is also crucial to remember the stress that human activity can put on these areas. This impact on natural habitats, if left uncontrolled, can lead to greater pollution, soil erosion, loss of natural habitats and even the total eradication of endangered species. There is the need for visitors to focus on environmental protection and eco-friendliness to contribute to reducing the negative impact on our natural environment. When it comes to conserving wildlife, DST extends it support to leading industry partners as they help safeguard Dubai’s wildlife and habitats, providing them with natural environments that they can rely on and thrive in. This includes the Emirates Nature-WWF, a leading non-profit organisation established to conserve the nation’s natural heritage – from combating climate change to safeguarding the seas, the land and their associated biodiversity.